고려시대 만들어진 종으로 1967년 경기도 여주군 금사면 상품리에서 우연히 발견된 것으로, 크기는 길이 84㎝, 입지름 55㎝이다. 종을 매다는 고리인 용뉴는 한마리의 용이 고개를 들고 있는 모습이며, 소리의 울림을 돕는 용통은 6단의 마디로 구획하였고, 용통의 각 부분마다 덩굴무늬를 양각하였다. 종의 상단과 하단, 9개의 돌출된 모양의 연뢰를 둘러싼 사각형의 연곽에는 가늘게 연이은 구슬 모양의 띠를 돌리고, 그 내부에 모란 덩굴무늬를 장식하였다. 연곽내의 연뢰는 꽃으로 도드라지게 표현하였다. 종 몸체에는 천흥사종(국보 제280호)의 비천상과 달리 불상과 보살상을 번갈아가며 부조하였다. 종을 치는 부분인 당좌 역시 종 몸체에 불 보살상과 교대로 4곳에 배치하였다. 종 몸체에 하대 윗부분 한쪽에 구획을 만들어 제작 연대와 중량을 알 수 있는 명문을 음각하였는데, 고려 문종 12년(1058)에 만들었음을 알 수 있다. This bronze bell was accidentally found in 1967 while collecting scrap metal in Sangpum-ri, Geumsa-myeon, Yeoju-gun, Gyeonggi-do. 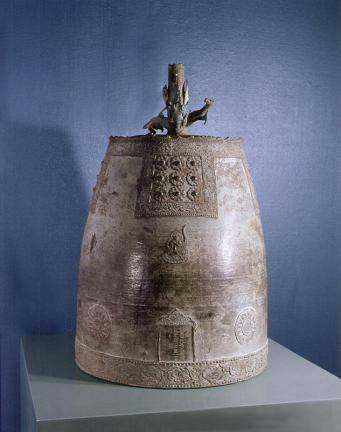 Made during the Goryeo Dynasty, it has length of 84 cm and mouth diameter of 55 cm. 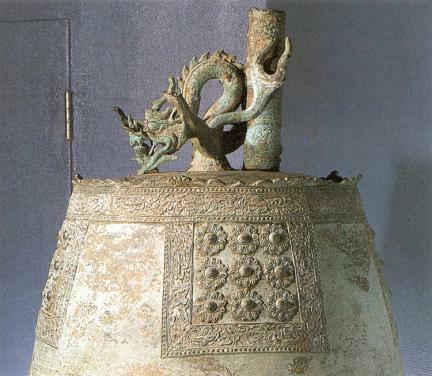 The hanging loop of the bell, called yongnyu, was made in the shape of a dragon with its head held upward. The hollow post, functioning as a resonator, is divided into 6 segments, with a vine pattern engraved on each segment. The top and bottom of the bell as well as the square-shaped frame surrounding 9 protruding bumps are encircled with a band of thinly linked beads. The inside of the frame is decorated with a peony vine design. The round bumps inside the frame are made in the form of flowers. Unlike the Bronze Bell Inscribed with “Cheonheungsa Temple” in Seonggeosan Mountain (National Treasure No. 280), the image of a flying deity is engraved on four different parts on the body of the bell. 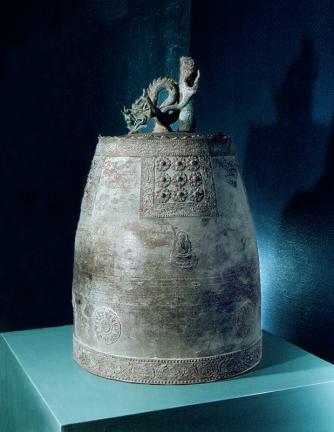 In particular, two images of Bodhisattva wearing a crown are placed in symmetry on this bell. 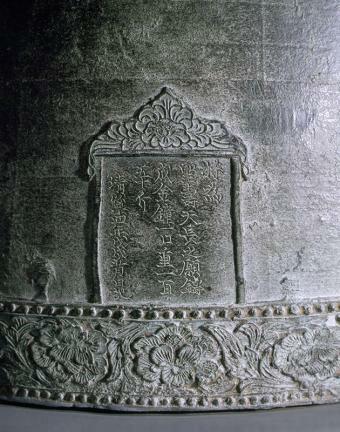 The chamber for striking the bell is put alternately with the image of Bodhisattva in four different places. The writing engraved on the lower part of the bell body tells the weight and production year of the bell, i.e., 12th year of the reign of King Munjong (1058) of the Goryeo Dynasty.